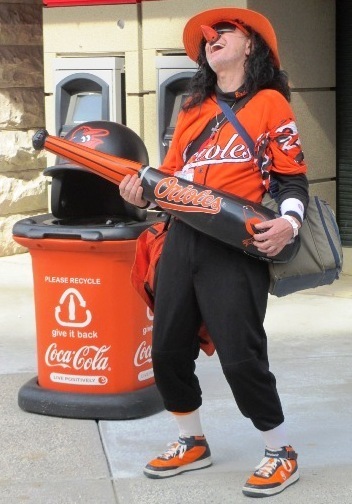 I am frequently asked, can you bring food into Camden Yards? The short answer is yes, you can…the Orioles allow a 16*16*8 soft-sided bag or cooler, so long as it doesn’t contain alcohol or potential projectiles. But the best part of this money-saving tip is the possibilities you have with the numerous outside vendors…so here are three tips on where you can find cheap outside grub to bring into the Yard. Inside the ballpark, it costs more without the roll. 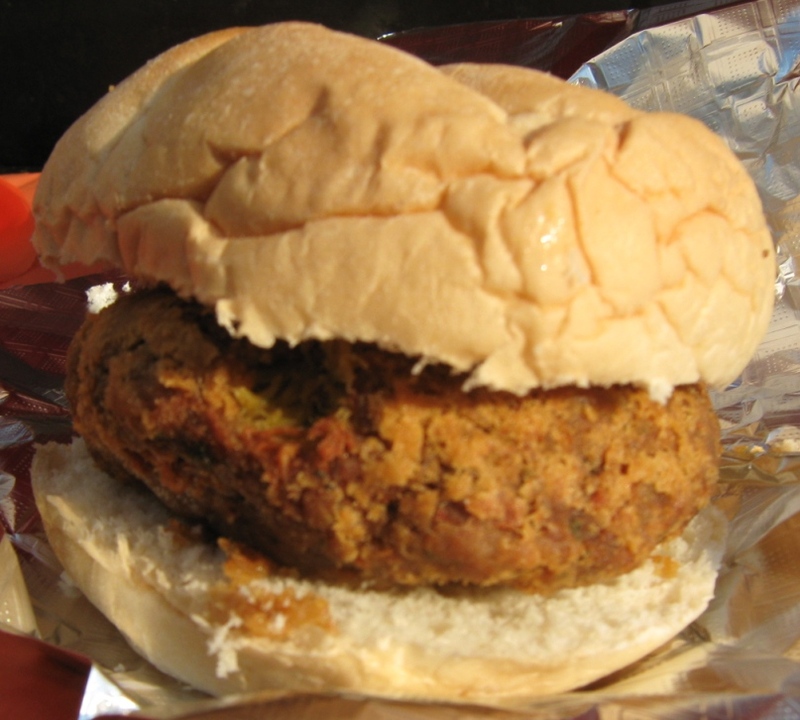 1) Pickles Pub/Slider’s/The Bullpen. I’m not sure which of these three corner pubs sets up all of the tents and outdoor grills and full bars, but I expect it’s all of them. The three establishments are across the street from the ballpark on Washington Street, and the entire area gets packed with pre- and post-game partiers. 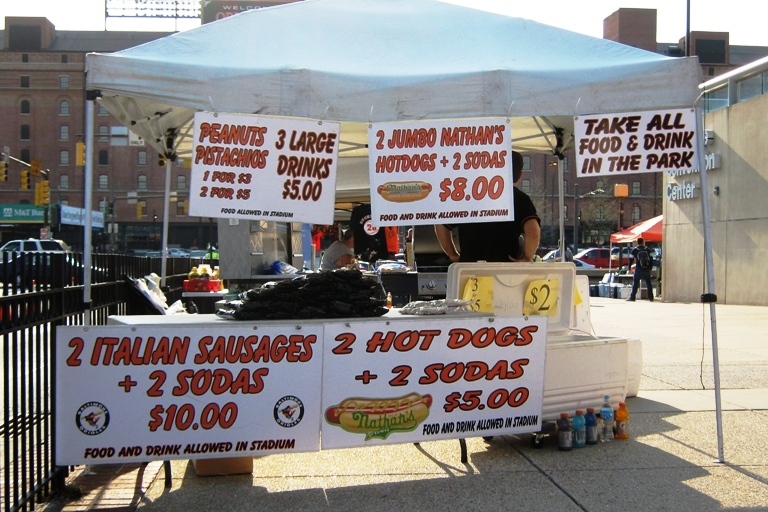 You can get a hefty dog, sausage, burger, or crab cake sandwich here for much less than you’d pay inside the ballpark, of course, and there are tables with people selling peanuts, pistachios and bottled water too. Best part? Have a cheap Natty Boh while you’re filling your goody bag…since you can’t get cheap beer OR Natty Boh inside the ballpark. With so many combinations, there’s sure to be one for you! 2) Vendors On Howard And Conway Streets. There are a plethora of vendors with grills selling dogs, sausages and chicken sandwiches, and they’ll offer you a nice deal if you’re willing to haggle and offer to buy more at a discount. As with the vendors near Pickles Pub, on Conway Street, you can also buy much cheaper gear and souvenirs. This is ideal for people arriving by Light Rail…the vendors are right there across the street. Photo courtesy of the Old Otterbein United Methodist Church. They said I could use it. 3) The Peanut Church. 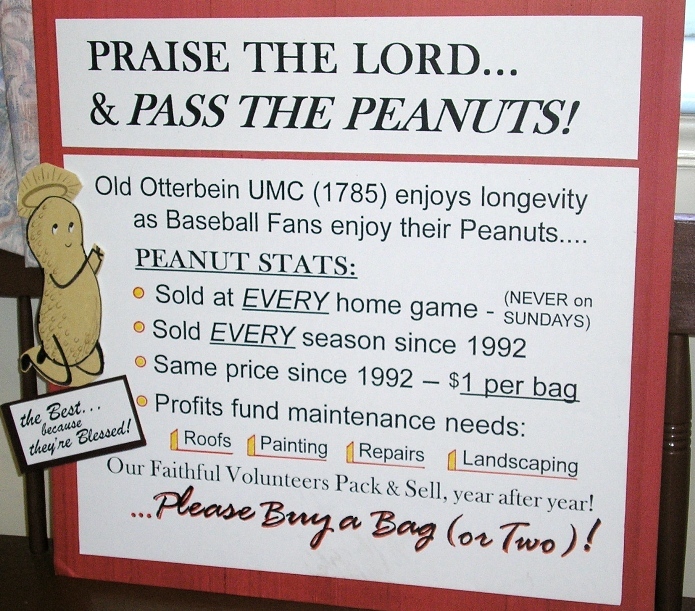 The Old Otterbein United Methodist Church is nicknamed the “Peanut Church”…they’ve been selling fresh bags of roasted peanuts cheaply since Camden Yards opened in 1992, and they’ve used the profits to maintain the church with a new roof and painting and such. If you’re a person of faith you’ll probably think it’s a cool thing. It’s on Conway Street, and if you’re coming from the Inner Harbor you can’t miss it. Finally, there’s a Jimmy John’s and a Chipotle just steps away, if you want bring food into Camden Yards from someone familiar. But that’s kinda boring. You can bring food into Camden Yards and save quite a few bucks; but you do have great food options inside the park too, like several variations of crab meat items.